COMMENTS:        This trigger occurred at longitude,latitude = 42.10,-20.09 [deg]. COMMENTS:        NOTE: This BAT event is temporally(0.0<100sec) coincident with the FERMI_GBM event (trignum=496976720). COMMENTS:        This trigger occurred at longitude,latitude = 11.63,24.32 [deg]. COMMENTS:        NOTE: This GBM event is temporally(0.0<100sec) coincident with the SWIFT_BAT event (trignum=714404). COMMENTS:       NOTE: This SPIACS event is temporally(0.0<100sec) coincident with the FERMI_GBM event (trignum=496976720). Dec(J2000) = -57d 16' 57"
with an uncertainty of 3 arcmin (radius, 90% containment, including systematic uncertainty). The BAT light curve showed a complex structure with a duration of about 3 sec. The peak count rate was ~11000 counts/sec (15-350 keV), at ~1 sec after the trigger. Dec(J2000) = -57d 15' 40.6"
with an uncertainty of 3.9 arcseconds (radius, 90% containment). This location is 78 arcseconds from the BAT onboard position, within the BAT error circle. This position may be improved as more data are received; the latest position is available at http://www.swift.ac.uk/sper. We cannot determine whether the source is fading at the present time. No spectrum from the promptly downlinked event data is yet available to determine the column density. UVOT took a finding chart exposure of 150 seconds with the White filter starting 68 seconds after the BAT trigger. No credible afterglow candidate has been found in the initial data products. The 2.7'x2.7' sub-image covers 100% of the XRT error circle. The typical 3-sigma upper limit has been about 19.6 mag. The 8'x8' region for the list of sources generated on-board covers 100% of the XRT error circle. The list of sources is typically complete to about 18 mag. No correction has been made for the expected extinction corresponding to E(B-V) of 0.01.
with an uncertainty of 2.0 arcseconds (radius, 90% confidence). Analysis of the promptly available data is online at http://www.swift.ac.uk/sper/714404. Dec (J2000): -57d 15' 39.4"
We observed the field of GRB 1601001A (Page et al., GCN 19967) with the ESO Very Large Telescope Unit 2 (Kueyen) equipped with the X-shooter spectrograph. Close to, but outside, the enhanced XRT position (Osborne et al., GCN 19969), in our acquisition image we detect a bright, pointlike source at coordinates RA = 04:47:40.71, Dec = -57:15:36.8. This source is faintly visible in the archival DSS data and is pointlike in our images (0.75" seeing). A spectrum was secured of this object, for a total of 4x600 s, starting on Oct 1.299 UT (6.1 hr after the GRB). The continuum is consistent with a stellar spectrum, and we conclude that this target is not associated with GRB 161001A. Our slit, at a position angle of 319.6 deg (CCW from north), does however cover a portion of the XRT error circle. Within the wings of the the PSF of the DSS object, approximately 0.8 arcsec SE, we detect a number of emission lines which are consistent with [O II], Hbeta, [O III] and Halpha at a common redshift of z = 0.891, revealing the presence of a background object. While we cannot accurately determine its position from the slit information alone, that is consistent with being at the edge of the XRT error circle. Our images also hint a faint extension of the DSS object at a position consistent with that of the emission lines, which could represent the continuum emission of the object. As such, this is a candidate host galaxy of GRB 161001A. We caution that we have no way to confirm the association between the emission line object and the GRB. No variability can be inferred from our data, and as we lack an estimate of the continuum flux, we can not presently quantify the chance association probability. We acknowledge excellent support from the ESO observing staff at Paranal, in particular Zahed Wahhaj, Jonathan Smoker, and Claudia Cid. We have analysed 6.9 ks of XRT data for GRB 161001A (Page et al. GCN Circ. 19967), from 51 s to 34.6 ks after the BAT trigger. The data comprise 128 s in Windowed Timing (WT) mode (the first 7 s were taken while Swift was slewing) with the remainder in Photon Counting (PC) mode. 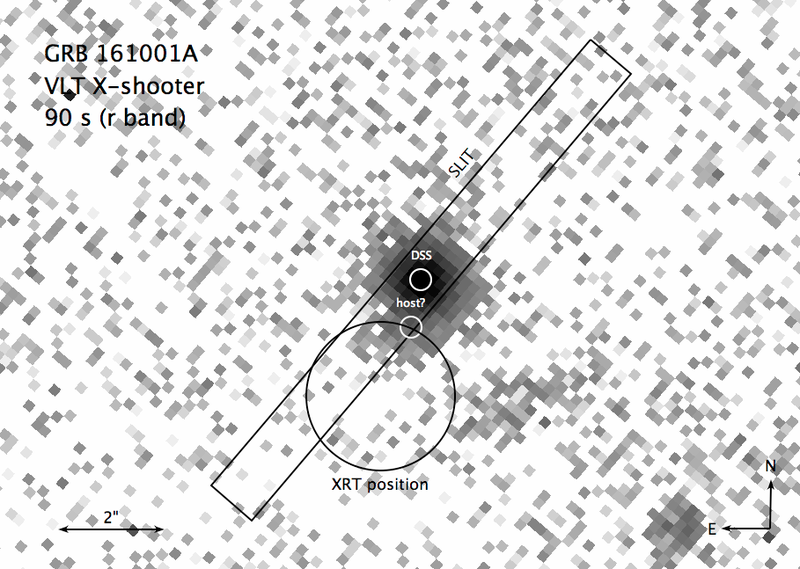 The enhanced XRT position for this burst was given by Osborne et al. (GCN Circ. 19968). The late-time light curve (from T0+5.8 ks) can be modelled with a power-law decay with a decay index of alpha=1.40 (+0.17, -0.16). A spectrum formed from the WT mode data can be fitted with an absorbed power-law with a photon spectral index	of 2.07 (+0.16, -0.15). The best-fitting absorption column is 4.9 (+0.9, -0.8) x 10^21 cm^-2, in excess of the Galactic value of 1.1 x 10^20 cm^-2 (Willingale et al. 2013). The PC mode spectrum has a photon index of 1.90 (+/-0.16) and a best-fitting absorption column of 6.5 (+1.2, -1.1) x 10^21 cm^-2. The counts to observed (unabsorbed) 0.3-10 keV flux conversion factor deduced from this spectrum is 4.6 x 10^-11 (7.4 x 10^-11) erg cm^-2 count^-1. If the light curve continues to decay with a power-law decay index of 1.40, the count rate at T+24 hours will be 5.4 x 10^-3 count s^-1, corresponding to an observed (unabsorbed) 0.3-10 keV flux of 2.5 x 10^-13 (4.0 x 10^-13) erg cm^-2 s^-1. The results of the XRT-team automatic analysis are available at http://www.swift.ac.uk/xrt_products/00714404. "At 01:05:16.72 UT on 01 October 2016, the Fermi Gamma-Ray Burst Monitor triggered and located GRB 161001A (trigger 496976720 / 161001045) which was also detected by the Swift/BAT (Page et al., GCN 19967). The GBM on-ground location is consistent with the Swift position. The angle from the Fermi LAT boresight at the GBM trigger time is 37 degrees. The GBM light curve consists of a dominant pulse preceded by weaker emission with a duration (T90) of about 2.2 s (50-300 keV). The time-averaged spectrum from T0-1.1 s to T0+2.9 s is best fit by a power law function with an exponential high-energy cutoff. The power law index is -0.89 +/- 0.10 and the cutoff energy, parameterized as Epeak, is 313 +/- 54 keV. The event fluence (10-1000 keV) in this time interval is (2.3 +/- 0.2)E-6 erg/cm^2. The 1-sec peak photon flux measured starting from T0+1.2 s in the 10-1000 keV band is 6.9 +/- 0.3 ph/s/cm^2. Dec(J2000) = -57d 15' 39.8"
with an uncertainty of 1.0 arcmin, (radius, sys+stat, 90% containment). The partial coding was 78%. The mask-weighted light curve shows several overlapping pulses that stars at ~T-0.3, and ends at ~T+3 s. The highest peak occurs at ~ T+1.6 s. T90 (15-350 keV) is 2.6 +- 0.4 sec (estimated error including systematics). The time-averaged spectrum from T-0.2 to T+3.1 sec is best fit by a simple power-law model. The power law index of the time-averaged spectrum is 1.14 +- 0.09. The fluence in the 15-150 keV band is 6.7 +- 0.4 x 10^-7 erg/cm2. The 1-sec peak photon flux measured from T+1.40 sec in the 15-150 keV band is 3.5 +- 0.2 ph/cm2/sec. All the quoted errors are at the 90% confidence level. Using a 16-ms binned light curve, the lag analysis finds a lag of 7 (+/- 13) ms for the 100-350 keV to 25-50 keV band, and -7.5 (+26, -19) ms for the 50-100 keV to 15-25 keV band, which is consistent with those of a short GRB. We observed the field of GRB 161001A (Swift trigger 714404; Page et al., GCN #19967) simultaneously in g'r'i'z'JHK with GROND (Greiner et al. 2008, PASP 120, 405) mounted at the 2.2m MPG telescope at the ESO La Silla Observatory (Chile). Observations started at 02:48 UT on 2016-10-01, 1.71 hours after the GRB trigger. They were performed at an average seeing of 2" and at an average airmass of 2.3. We found a faint singular point source which is south-west 2.2 arcsec away from the photometric center of nearby bright DSS2 object for which Kruehler et al. (GCN #19971) reported X-Shooter spectroscopy. The position is within the 2.3" Swift-XRT error circle reported by Evans et al. (GCN #19968) and also within the 1.9" enhanced XRT position (Osborne et al., GCN 19969), at RA (J2000.0) = 04 h 47 m 40.57 s DEC (J2000.0) = -57d 15' 39.2 with an uncertainty of 0.5" in each coordinate. Given magnitudes are calibrated against USNO as well as 2MASS field stars and are not corrected for the expected Galactic foreground extinction corresponding to a reddening of E_(B-V) = 0.01 mag in the direction of the burst (Schlafly & Finkbeiner 2011). MASTER-OAFA robotic telescope (MASTER-Net: http://observ.pereplet.ru) located in OAFA was pointed to the GRB161001A 29 sec after notice time and 41 sec after trigger time at 2016-10-01 01:05:57UT. On our first (10s exposure) set we not found OT within 6 square degrees field around SWIFT BAT error-box (Page et al., GCN 19967; Markwardt et al.,GCN 19974 ) brighter then 16.7 unfiltered magnitude. MASTER-SAAO robotic telescope (MASTER-Net: http://observ.pereplet.ru) located in SAAO was pointed to the GRB161001A 167 sec after notice time and 176 sec after trigger time at 2016-10-01 01:08:17 UT. On our first (40s exposure) set we haven`t found optical transient within SWIFT error-box. with respect to USNO B stars. We have archival images in MASTER SAAO DataBase at 2016-04-09 with 20.9 3-SIGMA limit. We see same object at same position. We note that our scale is 1 pix ~ 2 arcsec . So the DSS2 object (Kruehler et al., GCN 19971) and GROND afterglow candidate (Chen et al., GCN 19975) are inside the our pixel. GRB 161001A (Swift/BAT detection: Page et al., GCN 19967; Fermi GBM observation: Veres et al., GCN 19973) triggered Konus-Wind at T0=3D3919.479 s UT (01:05:19.479). The light curve shows a short pulse with a total duration of ~0.5 s. The emission is seen up to ~5 MeV. As observed by Konus-Wind, the burst had a fluence of (1.8 =B1 0.5)x10^-6 erg/cm2 and a 16-ms peak energy flux, measured from T0-0.016, of (8.0 =B1 3.5)x10^-6 erg/cm2 (both in the 20 keV - 10 MeV energy range). The spectrum of the burst (measured from T0 to T0+0.256 s) is best fit in the 20 keV - 10 MeV range by a cutoff power-law (CPL) function with the following model parameters: the photon index alpha =3D -0.46(-0.36,+0.48), and the peak energy Ep =3D 437(-117,+190) keV, chi2 =3D 30.0/36 dof. Fitting this spectrum with the GRB (Band) function yields the same alpha and Ep with only an upper limit on beta of -2.1, chi2 =3D 30.0/35 dof. We observed the field of GRB 161001A ( Page et al., GCN Circular #19967) with the near-infrared (J, H, Ks) simultaneous imaging camera SIRIUS attached to 1.4 m telescope IRSF ( InfraRed Survey Facility) in Sutherland observatory, South Africa. Given magnitudes were calibrated against 2MASS point sources in this field. The upper limits were determined as the magnitudes of the fainter star within 1 arcmin from the enhanced XRT position.